Benjamin Bahan is a Professor in the Department of American Sign Language and Deaf Studies at Gallaudet University. He is the co-author of the book Journey into the Deaf World (1996) and The Syntax of American Sign Language (2000). Benjamin has also co-directed and co-scripted the following videos: Audism Unveiled (2008) and A to Z: ABC Stories in ASL (2010). He currently serves as Executive Editor with Dirksen Bauman and Melissa Malzkuhn of the Deaf Studies Digital Journal (DSDJ.gallaudet.edu), the world’s first online, peer-reviewed academic and cultural arts journal to feature scholarship and creative work in both signed and written languages. H-Dirksen Bauman is Professor of Deaf Studies at Gallaudet University where he serves as the coordinator for the master’s program in Deaf Studies and Coordinator for the Office of Bilingual Teaching and Learning. He is the co-editor of the book/DVD project, Signing the Body Poetic: Essays in American Sign Language (2006) and editor of Open Your Eyes: Deaf Studies Talking (2008). Dirksen Bauman is also a producer and co-director of the film Audism Unveiled (2008). He currently serves as Executive Editor with Ben Bahan and Melissa Malzkuhn of the Deaf Studies Digital Journal (DSDJ.gallaudet.edu), the world’s first online, peer-reviewed academic and cultural arts journal to feature scholarship and creative work in both signed and written languages. John B. Christiansen is Professor Emeritus of Sociology at Gallaudet. He received his PhD in Sociology from the University of California, Riverside, in 1976 and taught at Gallaudet from 1977 until his retirement in 2009. His most recent book is Reflections: My Life in the Deaf and Hearing Worlds (2010). He co-authored (with Sharon Barnartt) Deaf President Now! The 1988 Revolution at Gallaudet University (1995) and (with Irene W. Leigh) Cochlear Implants in Children: Ethics and Choices (2002/2005). He has also written or co-authored dozens of articles and book chapters. A cochlear implant user (on one ear only), when he is not reading or writing he can usually be found riding his bicycle. Jane Dillehay has been a faculty member of Gallaudet since 1980 and is currently Full Professor in the General Studies program. She has been the Chairperson of the Biology Department and was Dean of the College of Liberal Arts, Sciences and Technologies for 9 years. She obtained her PhD in molecular biology from Carnegie Mellon University in 1980. Dr. Dillehay has collaborated with researchers from Lawrence Livermore National Laboratories and George Washington University Medical School in studying the mechanisms of eukaryotic DNA repair. Her current research interests are in bioethics and the application of the principles of cognitive psychology to effective pedagogy in science education. She obtained a cochlear implant in September 2008 and is learning to handle the world of sound. Jill Duncan is Head of Graduate Studies at the RIDBC Renwick Centre for Research and Professional Education at the Royal Institute for Deaf and Blind Children and Conjoint Senior Lecturer in the School of Education, University of Newcastle, Australia. She has had the privilege of learning from Professors Richard and Laura Kretschmer, and Professor Roberta Truax and working alongside Helen Beebe. She is a practicing Teacher of the Deaf and an Auditory-Verbal Therapist. Maribel Gárate is currently an Assistant Professor in the Department of Education at Gallaudet University. She earned two master’s degrees from Gallaudet University—Deaf Education: Elementary and American Sign Language Linguistics. Her PhD is in Deaf Education with a focus on bilingual education. Dr. Gárate has taught Deaf and Hard of Hearing students in both residential and mainstreamed settings. She is actively involved in teaching, training, consulting, and researching about ASL/English bilingual education. She has also conducted training and made presentations on topics related to bilingual methodologies, literacy instruction, and ASL linguistics to teachers and school administrators both nationally and internationally. Raychelle L. Harris is a faculty member at Gallaudet University in the Department of American Sign Language (ASL) and Deaf Studies where she serves as a coordinator of the masters’ program in Sign Language Teaching. She earned her doctorate from Gallaudet University in Deaf Education with a focus on Educational Linguistics. Her dissertation study was about the construction of academic language in a bilingual ASL/English preschool classroom with Deaf teachers and students. As a committed advocate of social justice, Dr. Harris presents and publishes about the ethics of research within Sign Language communities. Poorna Kushalnagar received her Ph.D. in Developmental Psychology with a focus in Developmental Cognitive Neuroscience at the University of Houston. She is a Ruth L. Kirstein NIH research fellow the University of Rochester School of Medicine and Dentistry. Her research interests focus on translating research to empirically supported interventions that result in improved quality of life outcomes among children and adolescents who are deaf or hard of hearing. She received her first implant in 2008 and second implant in 2009, both with similar experiences. Raja Kushalnagar has a JD in Law, a LLM in Intellectual Property Law, and recently completed requirements for a PhD in Computer Science at the University of Houston. He is an Assistant Professor in the Department of Information and Computing Studies at the National Technical Institute for the Deaf at Rochester Institute of Technology. His focus is accessible technology for deaf and hard of hearing students in mainstreamed classrooms. He has two implants, a second generation in 1999 and a third generation in 2009, and had very different experiences after each one. Irene W. Leigh, PhD, a deaf psychologist, has done high school teaching, psychological assessment, psychotherapy, and mental health administration. From 1985 to 1991 she worked at the Lexington Center for Mental Health Services, serving as Assistant Director the last two years. She has been a professor in the Gallaudet University Clinical Psychology doctoral program since 1992 and is currently Chair of the Department of Psychology. 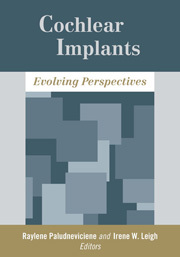 In addition to numerous presentations, she has published over 50 articles and book chapters, edited Psychotherapy with Deaf Clients from Diverse Groups (1999, 2010), co-authored Cochlear Implants in Deaf Children: Ethics and Choices (2002/2005), and Deaf People: Evolving Perspectives from Psychology, Education, and Sociology (2004). Her most recent book is A Lens on Deaf Identities (2009). She is a Fellow of the American Psychological Association and an Associate Editor for the Journal of Deaf Studies and Deaf Education. Deborah Maxwell-McCaw completed her master’s degree at Gallaudet University, and began her career in the mental health field by working at the Lexington Mental Health Center as a Mental Health Counselor providing individual, group and family counseling to deaf students and their families from 1989–1993. A desire for advanced training in psychodynamic therapy led her to pursue doctoral studies at The George Washington University, where she obtained her PhD in Clinical Psychology in 2000. She has been a faculty member in the Department of Psychology at Gallaudet University since 1996. Her current area of research is in the area of deaf identity development across the diverse deaf/hh population and its impact on psychological functioning. Dr. McCaw has been a cochlear implant user since 2006. Julie Cantrell Mitchiner is an Instructor with the Education Department at Gallaudet University. Julie received a master’s degree in Deaf Education with a specialization in Family-Centered Early Education from Gallaudet University. She is currently a doctoral candidate at George Mason University in Education with a specialization in Early Childhood Education and Multicultural/Multilingual Education. Before she started worked as a faculty, she taught preschool at Laurent Clerc National Deaf Education Center with deaf and hard of hearing children for six years. Her research interest is on bilingual education in ASL and English for young deaf and hard of hearing children. Donna A. Morere, PhD, is a Professor in the Department of Psychology (Clinical Psychology Program) at Gallaudet University. She is also the Neuropsychological Assessment Director for the Early Language Educational Study and Psychometric Toolkit at the Science of Learning Center on Visual Language and Visual Learning. She received her PhD in Medical (Clinical) Psychology from the University of Alabama at Birmingham in 1989. She maintains a private practice in Clinical Neuropsychology with a focus on deaf children with multiple challenges. She has presented and published on the neuropsychological assessment, reading skill development, and audiovisual processing of deaf individuals. Her current research involves the interaction of cognitive, linguistic, and perceptual process related to academic achievement in young deaf adults and reading skill development in deaf children. She has a son with bilateral cochlear implants. Debra Berlin Nussbaum is Coordinator of the Cochlear Implant Education Center (CIEC) at the Laurent Clerc National Deaf Education Center at Gallaudet University. She earned her master’s degree in Audiology from George Washington University and has worked at the Clerc Center since 1977; first as a pediatric audiologist and since 2000 as Coordinator of the CIEC. She has spearheaded efforts to look at the roles of spoken language and signed language in the education of children who are deaf and hard of hearing. She has developed numerous resource materials and professional training workshops, and speaks nationally and internationally on this topic. Raylene Paludneviciene is a faculty member with the Department of Psychology at Gallaudet University where she teaches primarily in the undergraduate program. She received her PhD in Clinical Psychology from Gallaudet University and completed a postdoctoral fellowship at the University of Rochester. Dr. Paludneviciene’s current research projects include the development of American Sign Language assessment tools. Spurned by the fact that half of her family has cochlear implants, she is also interested in studying the relationship between cochlear implants and the deaf community. Khadijat Rashid is a Professor in the Department of Business at Gallaudet University. She received her MBA from the University of Maryland at College Park and her PhD in International Relations from American University. She has been a member of the Gallaudet faculty since 1994, including a stint as Chair of the Department of Business. Her focus is primarily on international development and she has served on the boards of the World Deaf Leadership Program and Discovering Deaf Worlds, guiding development projects for deaf communities in developing countries. She was implanted in 2008. Ellen A. Rhoades, Ed.S., LSLS Cert AVT, a consultant and AV mentor for practitioners, provides training on an international level. She has been recognized with many awards including “Outstanding AV Clinician of the Year” from AVI, “Outstanding Professional of the Year” and “Outstanding Program of the Year” from AG Bell, and the “Nitchie Award in Human Communications” from the League for the Hard of Hearing. In addition to authoring many book chapters and papers for peer-reviewed publications, she co-edited the book Auditory-Verbal Practice: Toward a Family-Centered Approach. She served as director on the boards of AVI, AG Bell, and other nonprofit AV centers. In addition to having founded an AV center that she directed, she established and directed three other AV programs over a period of 25 years. Her more than 35 years of experience includes university instructor, AV practitioner, classroom teacher, supervisor, parent-infant coordinator, adult rehabilitation therapist, administrator, fundraiser, marketer, and grant writer. Due to bilateral congenital sensorineural deafness with genetic etiology, Ellen has been a hearing aid user since 1947 and a bilateral cochlear implantee since 1996. Marilyn Sass-Lehrer is a Professor at Gallaudet University in Washington, DC. She received a master’s degree in Deaf Education from New York University and a PhD from the University of Maryland in Early Childhood Education and Curriculum and Instruction. Her research and writing include professional competencies, guidelines for best practice, and family involvement. Dr. Sass-Lehrer is actively involved in national organizations and initiatives that address programs and policies for infants, toddlers, and their families. She is a co-author of Parents and their Deaf Children: The Early Years (2003), and co-editor of The Young Deaf or Hard of Hearing Child: A Family-Centered Approach to Early Education (2003). Susanne M. Scott is a Cochlear Implant/Bilingual Specialist at the Laurent Clerc National Deaf Education Center at Gallaudet University. She earned her master’s degree in Audiology from Gallaudet University and has worked at Gallaudet University and the Clerc Center since 1980; first as an educational audiologist, then as a clinical educator in the Department of Hearing, Speech and Language Sciences. She joined the Cochlear Implant Education Center in 2003 where she provides content expertise in cochlear implants and ASL/ English bilingual education for professionals and families at the Clerc Center and throughout the nation. Josh Swiller’s first book The Unheard: A Memoir of Deafness and Africa was a New York Times bestseller and received several awards. He has also published articles in the Washington Post, the Washingtonian magazine, the New York Times Magazine, and other national publications and has lectured in over twenty states. Deaf since age four, he received a cochlear implant 30 years later. He graduated from Yale University, received a master’s degree in Social Work from New York University, and cofounded Deaf Worldwide Community Advocacy Network (Deaf We Can) an international non-profit that focuses on ensuring the rights and access of the deaf in the developing world. Currently, he works as a special assistant to the chief of staff of Gallaudet. He thanks Brendan U. Stern for his assistance in preparing this chapter. Joseph Michael Valente is an Assistant Professor of Early Childhood Education at Pennsylvania State University. He is also affiliate faculty in the Disability Studies and Comparative and International Education programs. Dr. Valente is the author of the autobiographical novel and autoethnography d/Deaf and d/ Dumb: A Portrait of a Deaf Kid as a Young Superhero. Currently Dr. Valente is the co-Principal Investigator of the project Kindergartens for the Deaf in Three Countries, funded by the Spencer Foundation. He received his BA from Bates College and PhD from Arizona State University. To learn more about his work, please see http://joevalente.net. Raylene Paludneviciene is Associate Professor, Department of Psychology, Gallaudet University, Washington, DC. Irene W. Leigh is Professor Emerita, Psychology, Gallaudet University, Washington, DC.